Thou (or Elvira Donnarumma) beside me, singing in the Salone Margherita. Today, I snuck into (if I knew enough to say "sneaked" I wouldn't be the type of person who does such things) the not yet reopened Salone Margherita, the basement theater and music hall beneath the Galleria Umberto (photo, left) across from the San Carlo opera house. Workmen had left the door open, so for a while I prowled the darkened empty passages of what had been the first café-chantant in Italy. If it had been a film, I would have heard mysterious ghost melodies swell up all around me, my entire field of vision would have shimmered over to soft focus, and I —shy little me— would have beheld some of those buxom songbirds that one sees in Degas’ version of decadent Belle Époque high life (image, below, right). It would have been titillating, but since I can’t even write that word and keep a straight libido, let’s move on. 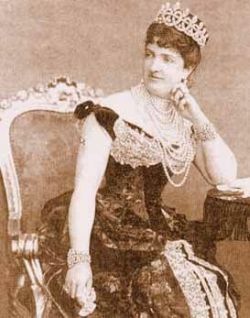 Belle Époque, café-chantant, fin de siècle —in the 1890s Italy imported the tradition from France— lock, stock and barrel-stave-corseted songstresses. 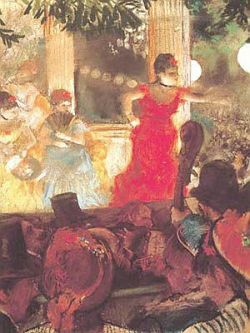 The café-chantant was originally an open-air venue, streetside cafes in Paris where professional musicians and female singers would perform popular music for the patrons. Popular music has always been at least somewhat anti-establishment, so there was that element, as well, going out at night to hear something you might not quite get at the opera, something more up-to-date and, one hopes, tantalizingly decadent. Maybe even fun. In Naples, the Salone Margherita was opened when the entire Galleria Umberto was inaugurated in 1890. (The Salone was named for King Umberto’s wife, the beloved queen consort, Margherita of Savoy (1851-1926; photo, left), whose name still remains on everyone’s lips around the world, as she was also the eponym for the pizza Margherita.) Elsewhere in Italy, the Gran Salone Eden in Milan and the Music Hall Olympia in Roma opened shortly thereafter. In hindsight, it made sense to have an exuberant, even daring, venue for entertainment to represent the new, young nation state of Italy; industry was tooling up, Italy was on the verge of colonial expansion in Africa (at the time, a sign of national vigor) and there was great optimism about the future that did not end until the First World War. The Salone Margherita lasted through that Great War (during which time, the songs, unsurprisingly, became tinged with realism) and even through the Greatest War. After that one, the Salone, like the large Gallery above it, became a bustling, grimy hive of “Hey-Joe-you-got-gum?” activity that was anything but elegant. The Salone was closed in 1952, then reopened, then closed again. This time around, the reports say it will open as some sort of an updated version of the real thing: intimate premises, singers, tables, drinks, and, one hopes, decadence. One should note that the music was not a French import, just the venue. Popular singers of the day pretty much sang what they had always sung. In Naples, that meant the Neapolitan Song, examples of which were being cranked out by the bale at the turn of the century by famous names such as E. Murolo, Bovio, Di Giacomo, Nardella, and countless others. 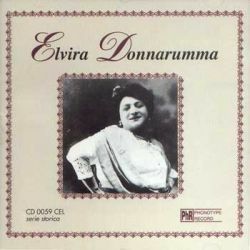 The best-known female singer of these songs in the early 1900s was, no doubt, Elvira Donnarumma (1883-1933). She started young, was befriended by Eleonora Duse, and gained popularity throughout Italy, both in live performances at places such as the Salone Margherita as well as through the young medium of recorded music. She turned out some 200 records in the 78 rpm format, recordings that have since been collected and re-released (image, right).